Kiki Smith (born USA) is an internationally renowned sculptor and innovative printmaker. Smith recently produced a wallpaper (with Studio Printworks, New Jersey) for an exhibition, Her Home at Museum Haus Esters, Krefeld, Germany in 2008 and this paper is now available commercially. Smith has often explored story-telling, connecting with nostalgia for childhood and reinventing myths and folk tales from a feminine perspective. In Maiden & Moonflower, a doll-like woman stands beneath a gnarled leafless tree populated with owls and moths, and surrounded by a scattering of stars. The naïve drawing and the disregard for perspective and scale are reminiscent of early woodcut illustrations, and the colourways – including Winterfrost, Moth, Dawn, Twilight – evoke a world of magic. 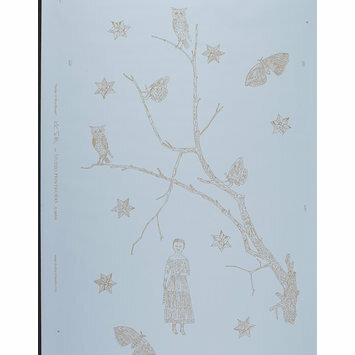 Pattern of tree branches and small female figures, with owls, moth etc against a starry sky. On a pale turquoise-blue ground.